After the FS-3040 and 3140, Kyocera-Mita has enriched its A4 range launching two Color models particularly in the USA, Germany and Luxemburg: the FS-C2026 and FS-C2126. The same distinguishing feature as applies between the two B&W machines recently released also applies in this family: the C2126 can fax. 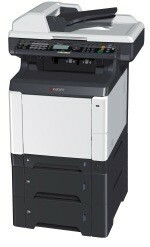 These 26ppm machines benefit from the ECOSYS technology like all the equipment named FS at Kyocera. They allow users to print from a USB key, and to scan to this peripheral. These MFPs have a paper capacity of up to 1,300 pages as standard, and automatic double-sided scanning on a 50-page ADF.